A stroke can have life-changing effects for seniors. However, a study published in Stroke: Journal of the American Heart Association, suggests that seniors living in supportive situations, such as tight-knit neighborhoods, have a better chance of surviving and thriving after a stroke. Additional literature also suggests that seniors suffering from a wide variety of conditions may benefit from positive socialization to bolster emotional wellbeing. 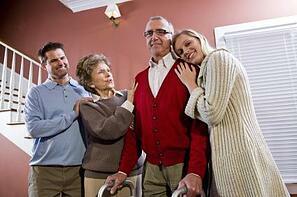 The best caregivers provide care for the overall wellbeing of a person. For example, perhaps your caregiver, Shawna, has “Prepare & Serve Breakfast” listed in her tasks on your homecare software or homecare system. While Shawna prepares the meal, she can also use the time to engage her client, Mrs. Walker, by asking about her favorite foods, food she dislikes, any special recipes in her family; and using the time to socialize by sharing stories, likes and opinions on something as simple as food. Times like these allow seniors to build a social connection to their caregivers and look forward to homecare shifts. Also encourage caregivers to note days when seniors seem more or less social in your homecare software or homecare system to help other care providers and family caregivers track any ups and downs in mood. Studies, like that from the American Heart Association, have shown that seniors who feel connections with other residents of their neighborhood often report better emotional wellbeing than seniors who feel isolated in their neighborhoods. To help bolster her neighborhood connections, Mrs. Walker’s family has approved walks for daily activity, which are always listed as a task in the ClearCare homecare software and homecare system that her caregiver, Shawna, uses. Now, Shawna accompanies Mrs. Walker on strolls around the neighborhood, where they often stop to talk to other neighbors out watering their lawns and talk about upcoming community events with other seniors on the street. Mrs. Walker, who used to be much more sedentary, is now looking forward to her daily walks and seeing who else is out and about. Arming family caregivers with simple ways to assist their elderly loved one with community socialization is a valuable service to offer clients. Consider sending a list of upcoming events at the local senior center, or senior-friendly community events like car shows and farmer’s markets, to your client families in a monthly email. Offer caregivers available to take seniors to these events, and remind families that eliminating feelings of isolation can have noticeable impacts on the mental wellbeing of seniors. Homecare software and a homecare system, like ClearCare, can also be a valuable tool in reminding caregivers of fun, social events that they will be accompanying seniors to. The same homecare software or homecare system can also be used to record notes about how the outing went to homecare managers and family caregivers. By encouraging the socialization of your clients and caregivers, your agency can develop a reputation as striving to keep seniors as happy as possible; even in the face of poor health or recovery from major health events like a stroke. With the power of a robust homecare software or homecare system, and dedicated caregivers, isolation, and its debilitating effects will be reduced for your clientele.